1. The superior cerebellar peduncle contains the major output from the cerebellum, the dentatothalamic tract. This tract terminates in the ventral lateral nucleus of the thalamus. It has one major afferent pathway, the ventral spinocerebellar tract. 2. The middle cerebellar peduncle receives pontocerebellar fibers, which project to the neocerebellum (pontocerebellum). 3. The inferior cerebellar peduncle has three major afferent tracts: the dorsal spinocerebellar tract, the cuneocerebellar tract, and the olivocerebellar tract from the contralateral inferior olivary nucleus. 1. The cerebellar cortex has three layers. a. The molecular layer is the outer layer underlying the pia. It contains stellate cells, basket cells, and the dendritic arbor of the Purkinje cells. b. The Purkinje cell layer lies between the molecular and the granule cell layers. C. The granule layer is the inner layer overlying the white matter. It contains granule cells, Golgi cells, and cerebellar glomeruli. A cerebellar glomerulus consists of a mossy fiber rosette, granule cell dendrites, and a Golgi cell axon. 2. Neurons and fibers of the cerebellum a. Purkinje cells convey the only output from the cerebellar cortex. They project inhibitory output [i.e., 7-aminobutyric acid (GABA)] to the cerebellar and vestibular nuclei. These cells are excited by parallel and climbing fibers and inhibited by GABA-ergic basket and stellate cells. b. Granule cells excite (by way of glutamate) Purkinje, basket, stellate, and Golgi cells through parallel fibers. They are inhibited by Golgi cells and excited by mossy fibers. C. Parallel fibers are the axons of granule cells. These fibers extend into the molecular layer. cerebellar, and vestibulocerebellar tracts. They terminate as mossy fiber rosettes on granule cell dendrites. They excite granule cells to discharge through their parallel fibers, e. Climbing fibers are the afferent excitatory (by way of aspartate) fibers of the olivocerebellar tract. These fibers arise from the contralateral inferior olivary nucleus. They terminate on neurons of the cerebellar nuclei and dendrites of Purkinje cells. III. THE MAJOR CEREBELLAR PATHWAY (Figure 15-1) consists of the following structures. A. 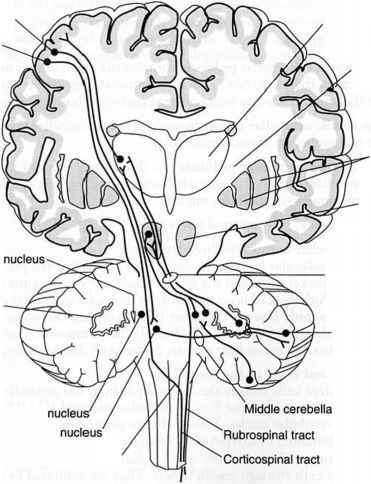 The Purkinje cells of the cerebellar cortex project to the cerebellar nuclei (e.g., dentate, emboliform, globose, and fastigial nuclei). B. The dentate nucleus is the major effector nucleus of the cerebellum. It gives rise to the dentatothalamic tract, which projects through the superior cerebellar peduncle to the contralateral ventral lateral nucleus of the thalamus. The decussation of the superior cerebellar peduncle is in the caudal midbrain tegmentum. Figure 15-1. The principal cerebellar connections. The major efferent pathway is the dentatorhalamocor-tical tract. The cerebellum receives input from the cerebral cortex through the corticopontocerebellar tract. C. The ventral lateral nucleus of the thalamus receives the dentatothalamic tract. It projects to the primary motor cortex of the precentral gyrus (Brodmann's area 4). 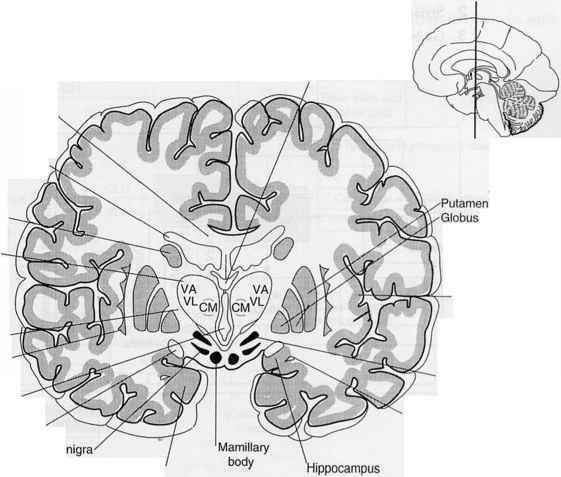 D. The motor cortex (motor strip, or Brodmann's area 4) receives input from the ventral lateral nucleus of the thalamus. It projects as the corticopontine tract to the pontine nuclei. E. The pontine nuclei receive input from the motor cortex. Axons project as the pontocerebellar tract to the contralateral cerebellar cortex, where they terminate as mossy fibers, thus completing the circuit. A. Hypotonia is loss of the resistance normally offered by muscles to palpation or passive manipulation. It results in a floppy, loose-jointed, rag-doll appearance with pendular reflexes. The patient appears inebriated. B. Dysequilibrium is loss of balance characterized by gait and trunk dystaxia. C. Dyssynergia is loss of coordinated muscle activity. It includes dysmetria, intention tremor, failure to check movements, nystagmus, dysdiadochokinesia, and dys-rhythmokinesia. Cerebellar nystagmus is coarse. It is more pronounced when the patient looks toward the side of the lesion. A. Anterior vermis syndrome involves the leg region of the anterior lobe. 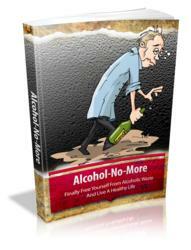 It results from atrophy of the rostral vermis, most commonly caused by alcohol abuse. It causes gait, trunk, and leg dystaxia. B. Posterior vermis syndrome involves the flocculonodular lobe. It is usually the result of brain tumors in children and is most commonly caused by medulloblastomas or ependymomas. It causes truncal dystaxia. C. Hemispheric syndrome usually involves one cerebellar hemisphere. It is often the result of a brain tumor (astrocytoma) or an abscess (secondary to otitis media or mastoiditis). It causes arm, leg, and gait dystaxia and ipsilateral cerebellar signs. D. Cerebellar tumors. In children, 70% of brain tumors are found in the posterior fossa. In adults, 70% of brain tumors are found in the supratentorial compartment. 1. Astrocytomas constitute 30% of all brain tumors in children. They are most often found in the cerebellar hemisphere. After surgical removal, it is common for the child to survive for many years. 2. Medulloblastomas are malignant and constitute 20% of all brain tumors in children. They are believed to originate from the superficial granule layer of the cerebellar cortex. They usually obstruct the passage of cerebrospinal fluid (CSF). As a result, hydrocephalus occurs. 3. Ependymomas constitute 15% of all brain tumors in children. They occur most frequently in the fourth ventricle. They usually obstruct the passage of CSF and cause hydrocephalus.